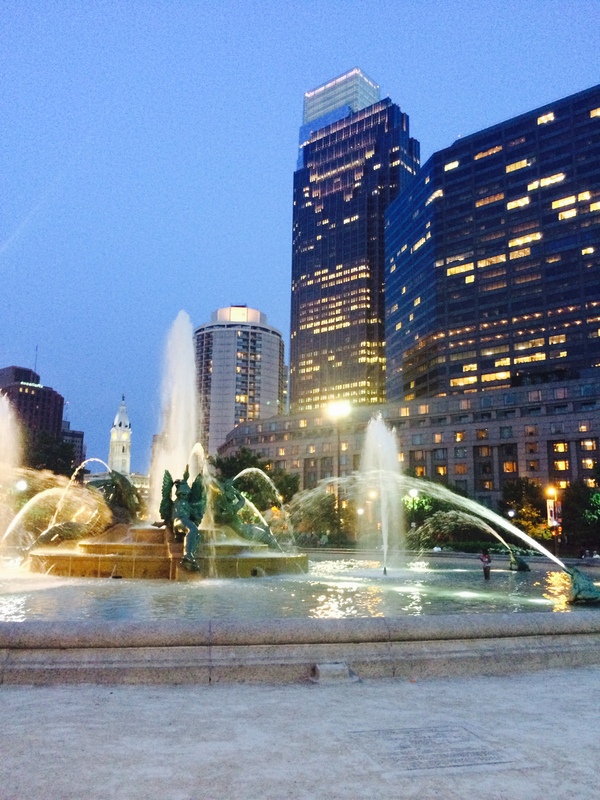 We got up earlyish and decided to hit downtown Philly to take in some culture and history! We headed to the US Mint first. It took us forever to find parking. Like forever. We should have predicted it because it is a holiday weekend after all but it still seemed like a lot of effort for parking. Once we finally a lot that was open, we decided we weren’t moving the car until it was time to leave and that we were going to walk around and see all of Philly that we wanted to make the parking worth it. Dramatic, I know. I’m pretty sure they must not let you take pics inside the Mint because neither Mark or I have pics from inside. It was a pretty cool self guided tour that took us about 25 minutes to do. In theory, the mint is always making coins and anytime you would visit it, you could see it in action. You basically walk around a catwalk above the production floor and look down on everything. It seemed like a slow day but it did seem like things were happening when we were there. There were interactive displays and computers that told you everything you were seeing below you and we learned a decent amount. Mark on his phone of course, but outside the Mint again! Since we were super close to the Liberty Bell, we figured we would go check out what kind of line we were dealing with wait it out. As we were talking through the area where we thought the Liberty Bell was, there were hundreds, if not thousands of people standing in a line. Oh boy. Our hearts sank a little bit because there were just so many people. I asked one of the people who looked like security person where the line for the Liberty Bell started. She looked at me like I had 3 heads and said she didn’t know. Well, okay.. isn’t that while you are standing here? I asked the next security person and he chuckled and said it was the next park area/building over and that all of these people were waiting in line for Hoagie Day. What is Hoagie Day you ask? A day where they give out free hoagies. Now I looked at the weather app and the real fee was 99 degrees outside with a humidity of like 100%. There is no way you could pay me to stand in that line for a free hoagie. Probably couldn’t even pay me to stand in that line for free anything. All the people. Oh vey. Once we found the real life for the Liberty Bell it was much more manageable. The Liberty Bell at last! It was so stinkin’, freakin’ hot and humid that we both were lightweight dying. We didn’t want to leave the AC of the Liberty Bell building, but we did. And we realized we were starving so we headed over to Reading Terminal Market. We love markets like this so much. So many fun vendors, fresh produce and friendly people! The perfect lunch & it had AC! We ate cheesecake #3 & #4. We needed some more AC so we went back to our car and drove over the Philly Art Museum. Now I’m not one that likes art too much but it is fun to walk around and look at the art for a little bit. The last week of driving, sightseeing and long days must have caught up to us because by the time we got back to our RV around 7, we were done for the night. I’m talking, we lounged around and are going to bed super early! Since we knocked out the Hershey stuff yesterday, we drove around the surrounding area today and did some exploring. Up first was a house that is shaped like a shoe! Now if you know me, you know I love shoes & if you don’t know me, just believe with all your heart that I love shoes. I’m probably the only person who packed at least 10+ pairs of heels for an RV road trip. And that is just the heels, you probably don’t want to know how many shoes in total I brought. We then stopped by an antique mall and walked around looking at all the treasures throughout. We were starrrving by this point and did a quick yelp search for a lunch spot and found a great cafe close by: Gaia, fresh food cafe. Highly recommend! Mark loves eating as healthy as possible (me too at times, but I’m certainly not ever going to pass up junk food) and this place was perfect. Raw/Vegan/Vegetarian/Gluten Free options and delicious fresh juices and smoothies. Plus they have a cute outside patio which no matter how hot & humid summers can be around here, I LOVE sitting outside to eat! Gaia Fresh Food Cafe! Yum! Up next was a tour of Turkey Hill Ice Cream plant. Also known as the “Turkey Hill Experience.” We opted out of waiting over 1.5 hours for the create your own ice cream part and settled for the self guided (hallelujah) tour. But don’t worry, the tour came with all you can eat free samples. HEAVEN. As per a suggestion from a friend, we stopped by the Hershey Hotel & Gardens and walked around. What a sight and certainly worth the $11 dollars/person admission sign I rolled my eyes when we walked up. It is a huge garden with several different areas which is located up on a hill overlooking the Hershey theme parks. We ventured into the butterfly house. we have passed on several butterfly houses before on other travels, but it didn’t take long before we decided we regret all those times. It was so cool! It was fun seeing all the butterflies and having them land on you as well. We will definitely be visiting more butterfly houses in the future. Mark with a butterfly on him! We stopped by a roadside farmer’s market on the way back to our RV and picked up some fresh fruit and veggies for dinner. 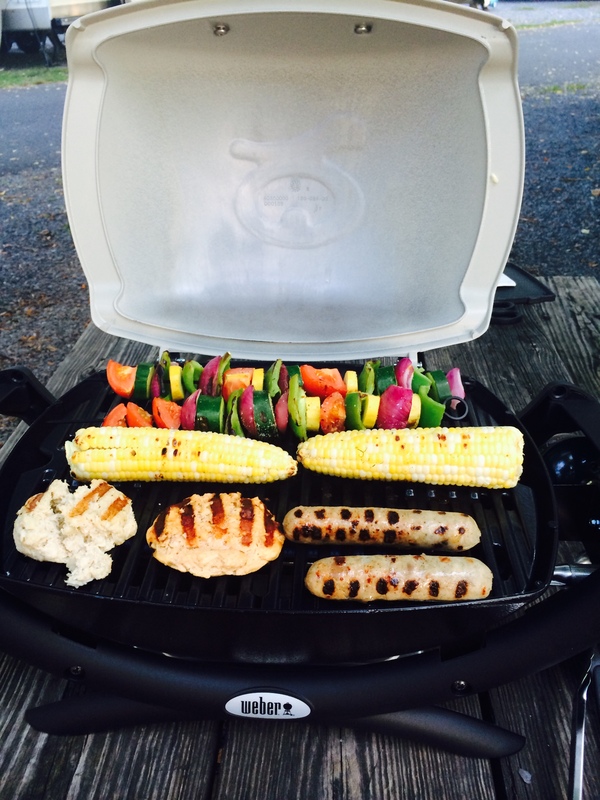 We broke in our new grill and cooked dinner at home for the first time. Delish! Tomorrow we move on to the greater Philadelphia area for a few days. Wish us luck because we didn’t plan ahead (I know you’re shocked) and we don’t have a campground picked for the holiday weekend coming up. EEEEEEKKKK. Walmart it just might be!